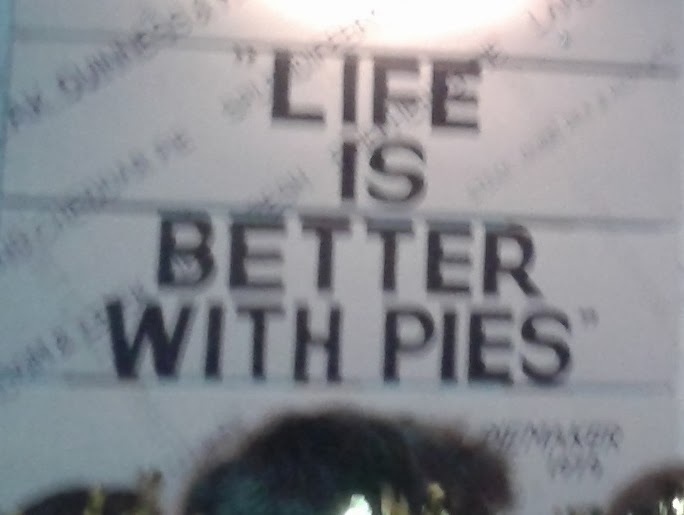 One of the signs in Porters English Restaurant proclaims, 'Life Is Better With Pies'. 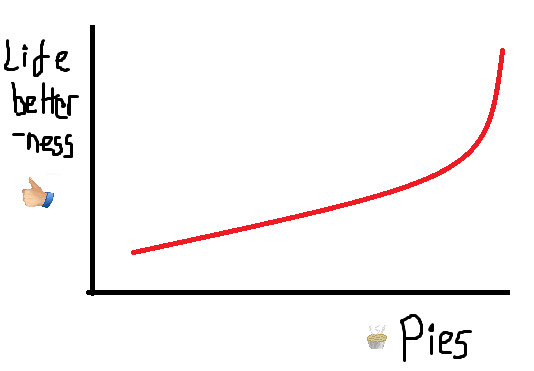 As we reach the milestone of 300 pie reviews it seems that here at Pierate we have lived out this statement with the little beige delights bringing us more joy than they do for most people. However, as we keep pushing the limits of how much pastry encased filling we can consume perhaps the statement might need an extention, 'Life Is Better With MORE Pies', the more pies we consume the more things seem to be getting better with page views and interest in our blog ever increasing. It almost seems like it is an exponential relationship. We have drawn a graph below to illustrate this. So as we continued to push the limits to reach some sort of pastry Nivarda we had to make the important decision of where to carry out our 300th pie review? Porter English Restaurant in Covent Garden, London seemed like the obvious choice. Somewhere a bit classy, a bit different but unashamedly proud of their 'World Famous Pies'. They do serve other food but with 10 different pies there is considerable menu space devoted to the object of our obsession. Porters seem to share this obsession with numerous references to pie as soon as you get in the door. 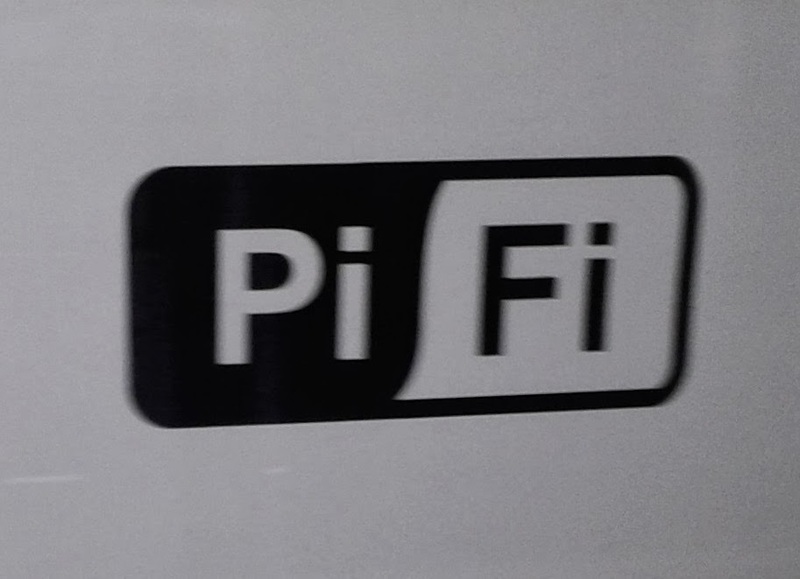 Infact there are signs advertising their 'Pi-Fi', British Pie Award and 'Licence to sell pies' even before going in the door. The randomness continues inside with an overtly British theme with Union Flag umbrellas and other British paraphernalia which added to the experience. The menu even advertises a 'pie consultant' to help you decided what pie to get. This really was a step above and beyond the normal pie eating experience and was much appreciated by people such as us who take pies very seriously. Our waiter doubled as our pie consultant, fortunately he let us know that some of the pies were of the 'top-crust' variety with only a pastry lid. On The Pierate Ship we prefer fully encased 'Proper Pies' so we all chose these versions for this special occasion. All the fully encased pies were 'shortcrust hot raised pies' which typically gives a harder, more solid pastry, although this wasn't necessarily the case for these pies. Pierateers TJP and SJL decided to go half and half with their pies and hence these were joint reviews. Like all these pies the Colour was a wonderful dark golden brown, much darker than many pies. This one arrived in perfect Condition and really looked like a quintessentially English pie. Being quite tall it had a good height to width ratio and consequently a strong Capacity. The Content tasted akin to a casserole with quite a sweet taste from the wine and vegetables. It would probably count as one of your five-a-day because there were plenty of peas to be seen. However, this did mean that it wasn't as meaty as some pies. 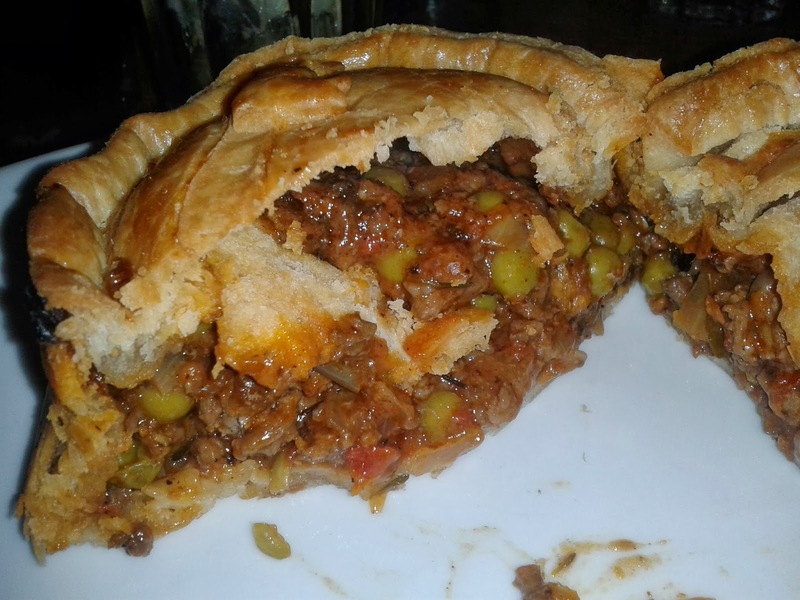 There were no complaints about Chewiness with a filling that slipped down well and pastry with a nice crunch on top and a bit of gooiness on the bottom (but not soggy). The pie was Consistently good with a nice variation to the flavour throughout due to the mix of flavours. This was a pie which left you wanting more, despite being quite large, which is surely a sign of a good pie! At £12.85 this is quite an expensive pie but comparable to other London pie restaurants. It came with a hearty meal so overall not bad value. 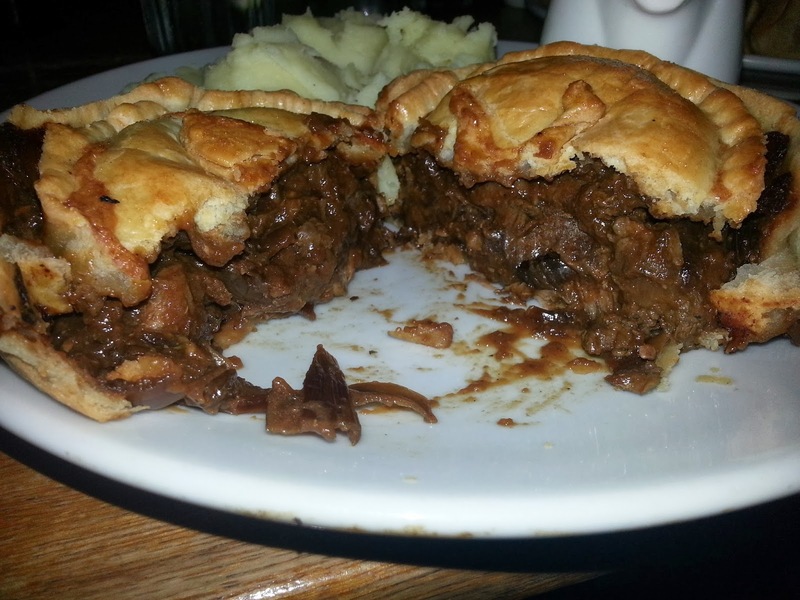 This was the pie which had won Silver at the British Pie Awards, but would it win any awards from the Pierateers? In terms of Condition and Colour this pie was very similar to the Minced Beef pie, however it was slightly more expensive at £13.50 but given that game tends to be expensive it didn't gain less points for Cheapness. The Capacity was again strong for a pie of this size. The Content was a great mix, containing Pheasant, Venison, and Rabbit which left it tasting really meaty, there was not a hint of veg in this pie. The venison in particular added a strong flavour which was delicious to begin with. However, this pie was not as Consistently good because the strong flavour began to get too much after a while and it was not a pie you could eat forever. This didn't mean it wasn't a good pie, the meat was tender and not at all Chewy. The texture and taste of the pastry was again top notch. 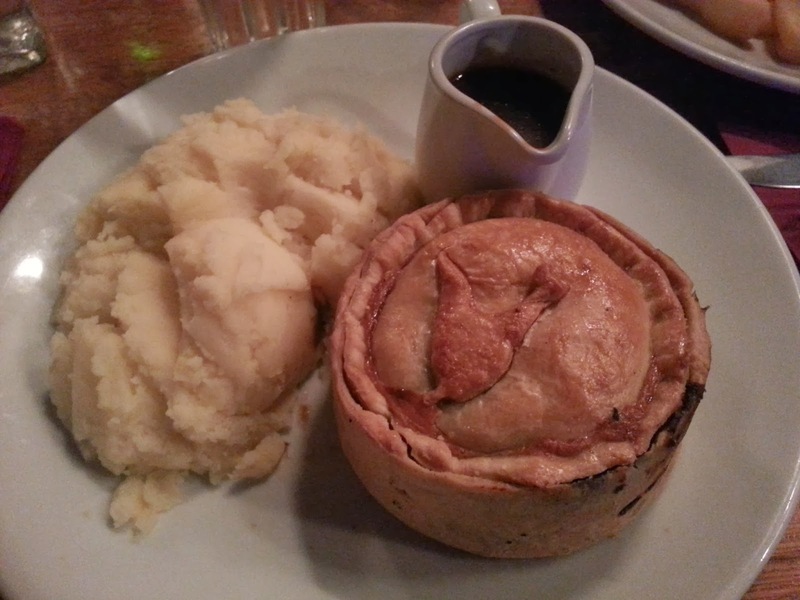 Overall this was one of the best game pies eaten on The Pierate Ship. 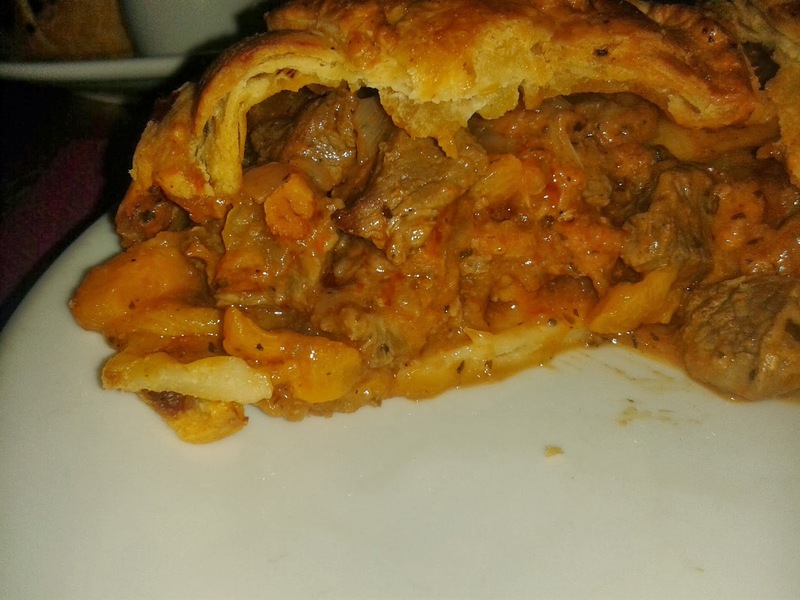 The Lamb and Apricot pie was eaten by Pierateer RAS and selected because it was one of the fully encased pies on the menu, with a full encasement of short crust hot raised pie pastry. 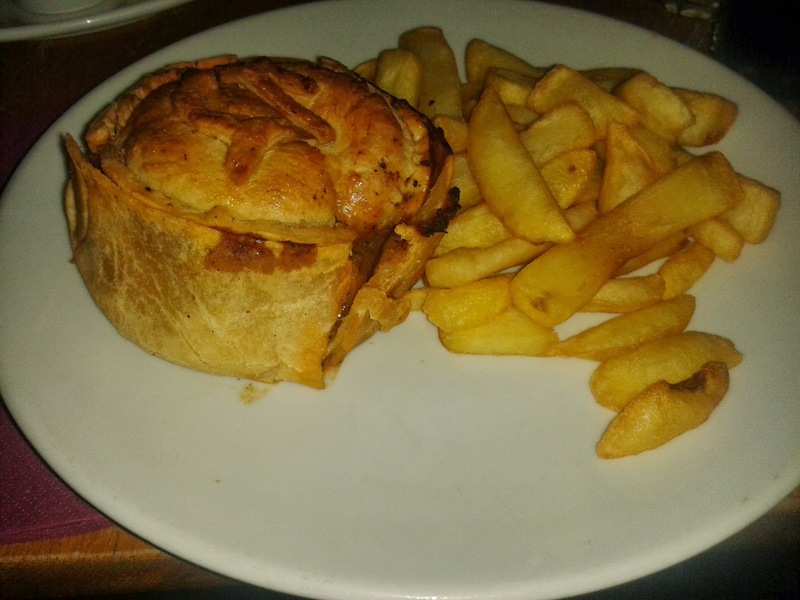 The pie came with chips and a jug of gravy, which I didn’t actually use because the pie itself was moist enough and the beef gravy I had been given in the gravy jug would not have worked at all with the lamb and sweet apricot flavoured gravy inside. In general, the condition of the pie was quite good, apart from a bit of an indent in one side, which was disappointing when you are paying over £10 for a pie meal. The condition is of course the first of the seven Cs to be scored, so to have your immediate first impression being a big indent is not ideal. The outer pastry suffered from this, and this in fact led to it being a bit dry in places. The lid pastry was very nice, and the sides and base were not too bad in general, however there were patches of dryness and the short crust hot raised pie pastry didn’t quite do it for me as a result. The capacity of this pie was quite strong, with plenty of pieces of lamb in there. The lamb was moist and quite tender, though there were a few more chewy bits too. On the flip side though, there was rather a lot of apricot too, which was soft and flavoursome but did rather bulk the content out. It was a lamb and apricot pie – I accept that – but I really wasn’t up for such a sweet fruity hit in so much of the pie, and some mouthfuls were 100% apricot. For a dinner pie, that just didn’t sit well with me. The ratio was definitely too strong in favour of the apricot. I wanted a meatilicious pie and while the apricot gave it something a bit different, I wouldn’t ever choose to have this combination again. I’d stick to lamb and mint (perhaps the lamb shank pie on the Porter’s menu) and leave the apricots for the pudding menu. 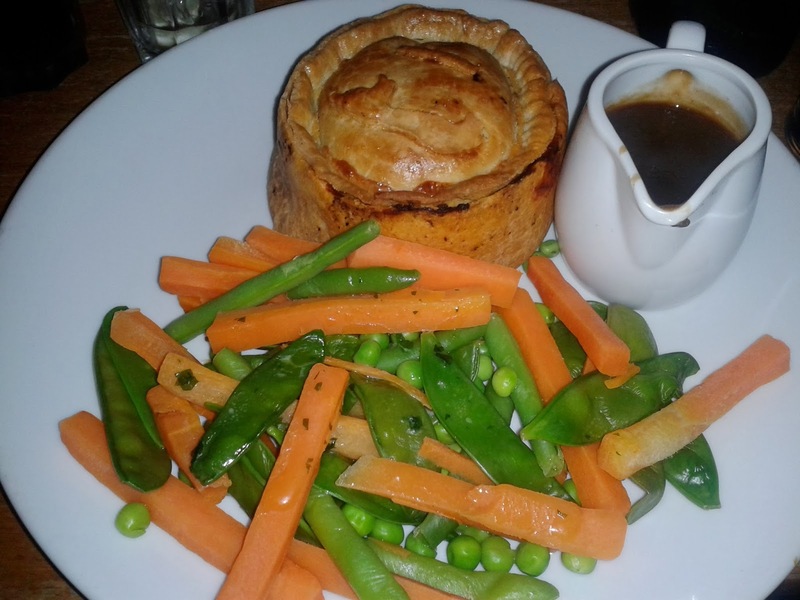 We were eating a whole meal – not just a pie - in a restaurant near Covent Garden in Central London, so I guess you have to expect a £12.85 price tag comes with the territory. However we are always considering with “Cheapness” whether the pie is worth the amount we pay, and I have to say I’ve had better pies for quite a few pounds less in London. It’s therefore not going to be a high scorer on cheapness. All in all, there were plenty of things going for it in this pie - the lamb was succulent and the pastry pretty good, but the content mix just didn’t really work for me. I’d stick to just the lamb pie next time and then this really would be a top ranked pie. So in summary two very good pies we would recommend, one a bit less so but still not bad! Worthy pies to be our 298th, 299th and 300th pie reviews. It is commendable that with all of these pies they have tried to do something a bit different, they certainly aren't the standard fare. 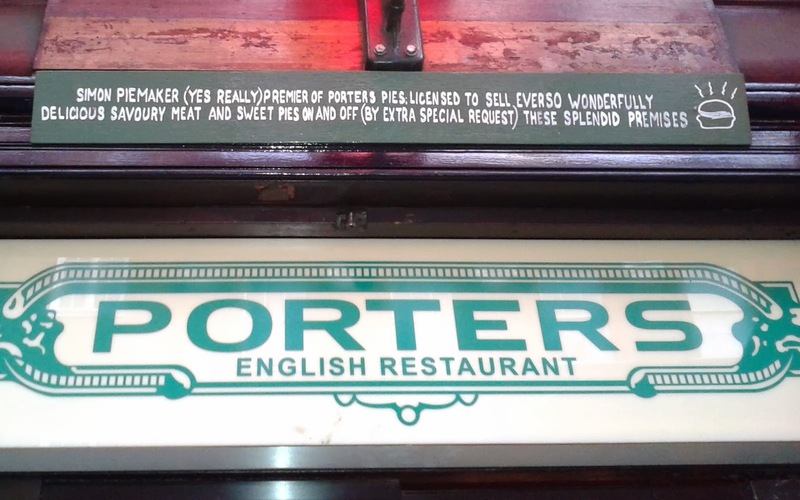 Overall the experience at Porters was fantastic and it is somewhere we would go back to, especially given that there are so many more pies to try! 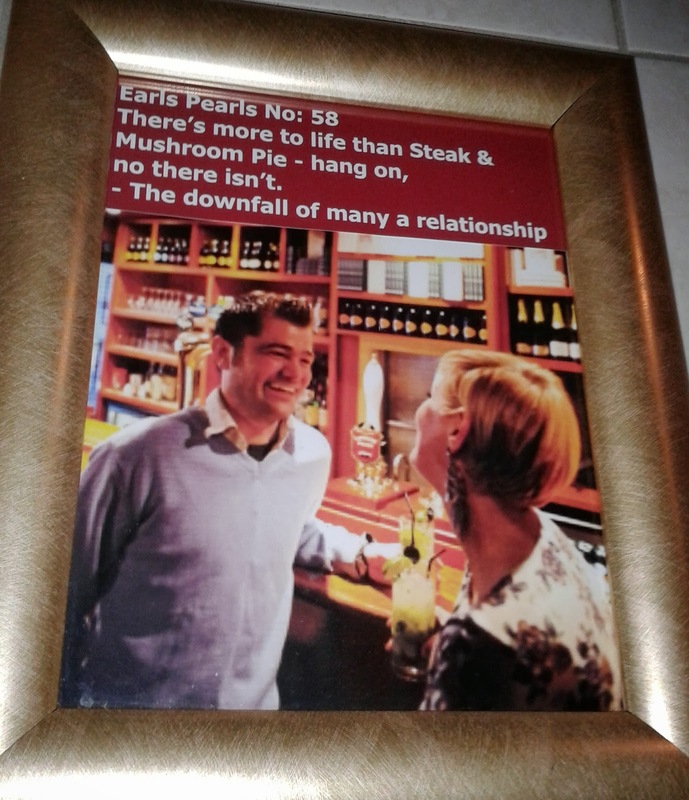 We leave you with this picture, one of many words of advice hanging on the walls at Porters. It is important to get your pie-orities right, we know where ours lie; life is better with pies! See where these pies ended up in the London Pie Rankings, Overall Pierate Pie Rankings or find other pies of a similar flavour.